I wasn’t so sure about the invite to go packrafting in Utah. It wasn’t anything personal. I didn’t have anything in particular against packrafting. In general, I’m all for pushing myself to try new things. Type two fun as they say. I believe that personal growth takes place beyond the confines of our comfort zone. So I’m constantly on the search for experiences that will take me to uncharted territory. Even if it’s just uncharted for me. In many ways packrafting seemed like just the experience I needed to fuel the fire inside me that felt a little dimmer than usual. A way to delve deeper. To experience the type of unadulterated wilderness that feeds the soul and inspires the imagination. As I understood it, that’s what packrafting was all about. A means to an end. Not just a tool, but a key that allows us to escape the ordinary and access that sense of awe and self-awareness that comes from complete immersion. Heart of Darkness type stuff. But opening my eyes that morning, seeing the backpack ready to go and propped up against my bedroom door, a wave of anxiety washed over me. I’d been home for a few days, for what felt like the first time in weeks, maybe months, and I wanted to stay right there. Perhaps to close my eyes and fall back asleep for a while longer. Maybe even binge-watch a show or two. And then I remembered I’d canceled Netflix - I wasn’t around enough to use it. I was too busy living the dream. Or so I was told by strangers multiple times a day on social media. And to be certain, I’m grateful for every person, opportunity, and place I’ve encountered since drastically veering from my carefully charted plans for life. But laying there that morning, a million trivial worries crossed my mind: What would I do without cell service for a full week? What would happen to my account if I couldn’t engage with my community? Would I lose potential job opportunities while I was gone? Obviously, I’d been disconnected from the outside world plenty of times over the last couple years. But for some reason, this time it felt different. More dramatic. Like there was a strange permanence to it. That feeling stuck with me on my flight to Las Vegas and lingered during the five-hour drive to Grand Staircase-Escalante National Monument. 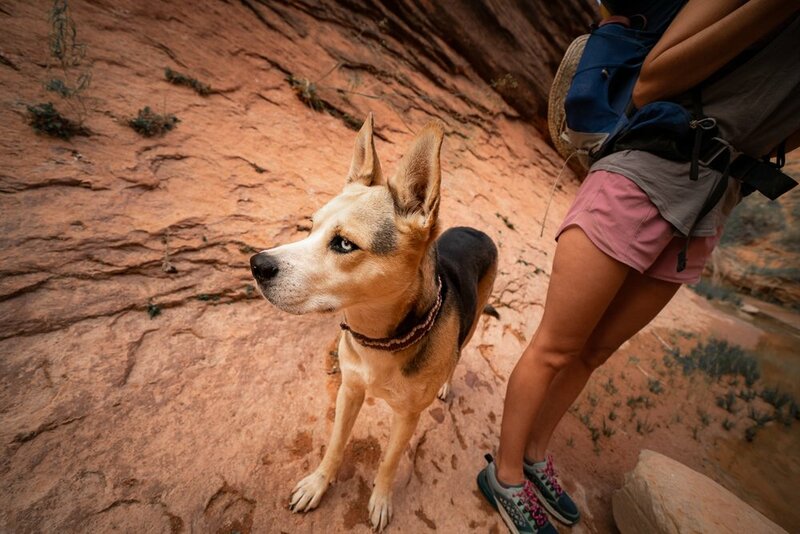 Quin and I met Mina, Juuso, and their dog Kira in the town of Escalante. It was already 10 PM and we were an hour late to the rendezvous. The group exchanged tired greetings in the dark and then jumped back into our respective cars. We had another two hours to travel down Hole In The Rock Road before reaching the trailhead for the backpacking portion of our adventure. As we pulled out of town, I refreshed my phone one last time. Then, as if on cue, we hit the first patch of bone-rattling washboard in the dirt road, and the last service bar disappeared. And with it, that nagging sense of anxiety that had followed me all day—from Seattle to Nevada, and halfway across Utah—floated away into the warm desert night. Feeling liberated, I tossed the phone into the bottom of my pack. The next morning we woke up with the sun and began organizing the gear we’d need for the next six days. Mina presented us with our Kokopelli Rogue Packrafts. Bright yellow and deflated, the lightweight rafts were folded neatly into a tight DuraFlame sized package. We didn’t know it at the time, but that little package of rubber and kevlar would become an extension of our bodies over the next few days. A home away from home. 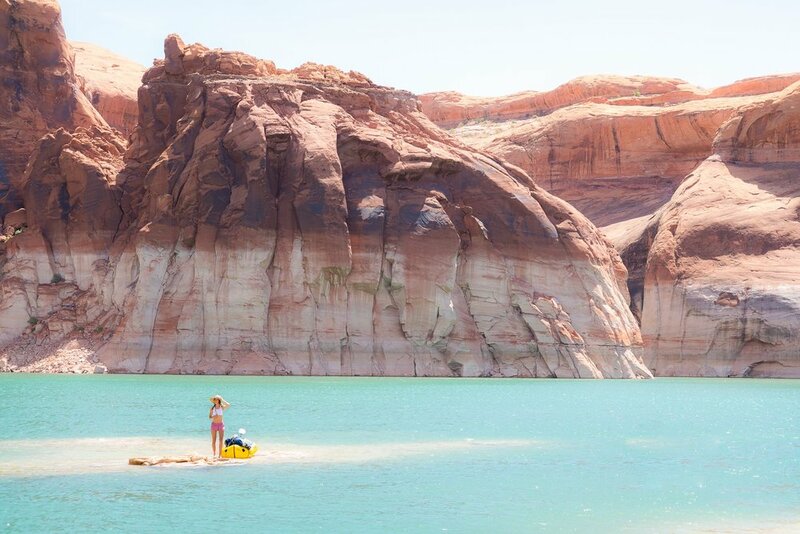 The only thing separating everything we cared about in life from the dark indifferent depths of Lake Powell. But for now we didn’t need them, so I shoved my packraft into my backpack with the rest of my gear, and closed the lid. It was time to hit the trail. The eight-mile trudge to the Escalante River was one of the slowest I can remember. Not that they were entirely unenjoyable miles. The company was good, and there was a sense of excitement and anticipation for the journey ahead. Everyone was anxious to inflate the packrafts and get out on the water. But first, we had to navigate our way through river beds, slot canyons, and chest high water - all under the blazing desert sun. That first night, my hips and shoulders were sore from where my pack had rubbed them raw over the course of the day. But laying in the tent, no sleeping bag, rainfly off, under a million stars, I felt completely content. Comforted by the thought that, starting tomorrow, my packraft would do all the heavy lifting for me. Once the packrafts were inflated, we strapped our packs onto the bows of the boat and pushed off toward the Escalante River. It was immediately apparent that it wasn’t going to be as easy as I’d anticipated. We were hindered by strong headwinds that day. It didn’t seem to matter which direction we headed. Somehow the wind was always against us. By the time we reached the first camp, I was officially wondering how I’d make it through the rest of the week. I regretted slacking on those upper body workouts the last few months - okay my entire life. Each attempt to make up ground was met with the futility of a person on a stationary rowing machine at a regatta. Noticing my plight, Quin tied the front of my raft to his in an attempt to keep me from blowing away. We paddled the last stretch together as Mina’s yell echo off the canyon walls from somewhere up ahead: we had made it to camp! Rounding the last bend, a giant arch framed the sky above the water. It was beautiful and larger than anything I could have imagined. 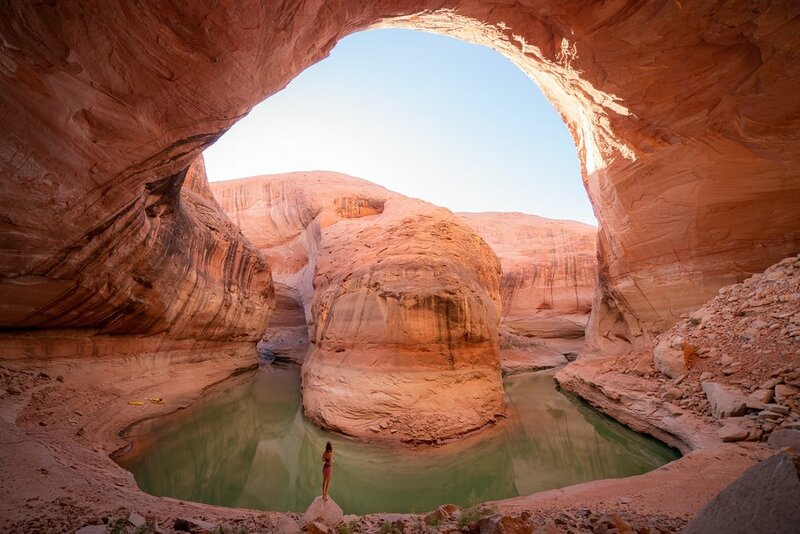 We set up camp in the alcove under the arch, overlooking a perfect horseshoe bend in the lake. A campfire was lit, food was had, and just like that, the struggles from the day faded into a distant memory. The wind disappeared after that first day, and every morning we were greeted with glassy water so calm the reflections created the illusion that we were paddling through the sky. Our rafts glided over the water, and a deep calm washed over the group. The repetitive motion of paddles slicing through water created its own therapeutic rhythm. We grew comfortable with the daily routine. Each of us in our own raft, in our own little floating universe. I was thankful for the less than ideal conditions that first day. It gave each day after that a little touch of magic. We were out on the water for five days. Every day we paddled down a new canyon in search of a place to call home for the night. The destination was almost always unknown, but never disappointing. Just as promised, the packrafts unlocked a whole new world of possibilities. We camped in backcountry sites inaccessible by foot. Unmarked places that exist only as abstract shapes on maps. Places with no established road, trail, or path in or out. And on more than one occasion it felt like we were the last people on earth. We stayed up late into the last night talking about life, dogs, and future adventures. The next morning, we packed up our rafts and hiked back out to the cars. It felt like it had been a lot longer than a week since we traveled down the rough dirt road to get here. I knew we were close to Escalante when I heard my phone vibrate with alerts. I fished it out of my pack. And then changed my mind. I didn’t care. The moment worthy experience wasn’t on my phone. It was right now. In this place. Basking in the sense of accomplishment that comes when you venture into the unknown and make it out the other side. I didn’t want to go on this trip. I wanted to stay back in the safety that I knew. But there’s no space to grow in the known. Out on the water, in my raft, I thought a lot about the trappings of comfort. There are no answers waiting for me in my bedroom, on my phone, comparing my path to others, worrying about missed opportunities. I’ve been to that place. I know how empty it is. The only opportunity that I was ever in danger of missing was this one. This packrafting trip wandering into the unknown.